As stated in our home page, the sulfur content of #2 Heating Oil is 3000 PPM, the maximum allowed by the State of Maryland. Approximately 99% of the sulfur in fuel is oxidized to sulfur dioxide during combustion and emitted from the stack or chimney. The remaining 1% of the sulfur in fuel converts to sulfur trioxide in the flame. This then reacts to form sulfuric acid, which condenses on any boiler or furnace surface below the dewpoint of the acid/water system – about 220 F. The acid reacts with iron from the wall to form iron sulfate scale (a corrosive product) on heat exchanger surfaces. Iron sulfate scale contributes significantly to the process of heat exchanger fouling. The efficiency of Oil-Fired Heating Systems degrades over time as heat exchanger surfaces become fouled. The rate of degradation is estimated at 2% per year and annual cleaning of the heat exchanger is required to maintain equipment performance. Studies of these findings have been conducted by Brookhaven National Laboratory (BNL) funded by the US Department of Energy, and by the CANMET Energy Technology Center (CETC) in Ottawa under sponsorship of the American Society of Heating Refrigeration and Air Conditioning Engineers (ASHRAE). The findings of these studies were documented by the New York State Premium Low-Sulfur Heating Fuel Marketplace Demonstration, a project funded by the New York State Energy Research and Development Authority (NYSERDA). 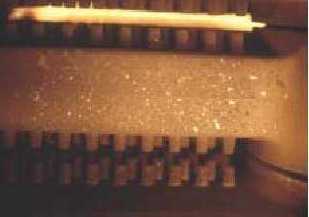 These photos show iron sulfate scale on boiler heat exchangers of the same make using heating fuel with different sulfur content as identified. Approximately 400 gallons were consumed. As you can see, High Sulfur #2 Fuel has produced considerable scale build up, thereby decreasing the efficiency of the boiler. Additionally, the heat exchanger now requires frequent cleaning. 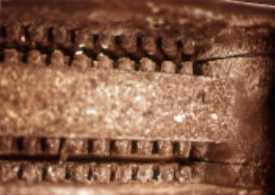 Otherwise the scale deposits shown in the photo will continue to build, further reducing boiler efficiency and eventually the scale deposits will corrode the heat exchanger. Excessive corrosion of the heat exchanger results in premature replacement of the heat exchanger or worse yet, entire heating system. ULTRA LS Heating Oil ™ leaves virtually no scale deposits on the heat exchanger because of the extremely low sulfur content. We are seeing very positive results first hand. Systems we installed 3-5 years ago still look brand new and have required no cleaning. Some studies have indicated consumers can save as much as $.14 per gallon because of the reduced maintenance requirements and increased fuel efficiency of heating systems. Once the #2 Oil is consumed, schedule a thorough cleaning and inspection of your heating system. ULTRA LS Heating Oil ™ will take care of the rest.